Our partnering and collaboration philosophy based on the understanding, that no-one can provide all solutions alone and keep technologies permanently state-of-the-art. Therefore, YUMAB focuses its internal research on antibody discovery and development, where company and team have a long scientific tradition and strength. For additional technologies, YUMAB has built an excellent and growing network of partners from academia, clinics and industry allowing to access a much broader expertise and portfolio of technologies. For other services and work packages to have access to the best possible solutions for our projects. Moreover, we are engaged to steadily improve the YUMAB® platform technologies and to help finding solutions for unmet medical needs. Here, we are working together with an outstanding scientific and clinical network as well as with industrial partners. Our philosophy is to bring the best technologies and ideas together and to push the boundaries of current drug development to a new level. We are open for partnering our technologies and know how with others to our mutual benefit. YUMAB focuses its primary work on the discovery and development of antibodies, where company and team have a long scientific tradition and strength. For additional services, we have built an excellent and growing network of potent partners from academia, clinics and industry allowing to access a much broader expertise and technology portfolio (e.g. peptide synthesis, cell line generation). These external services are managed, supervised and controlled by Yumab. That allows our clients to access many different technologies by just contracting and communicating with us. Besides contract research, YUMAB offers partnered antibody research & development for the mutual benefit of all partners. Focus are novel technologies or novel indication and immunotherapy strategies. Our concept is to bring the best technologies and ideas together and to push the boundaries of current drug development to a new level. 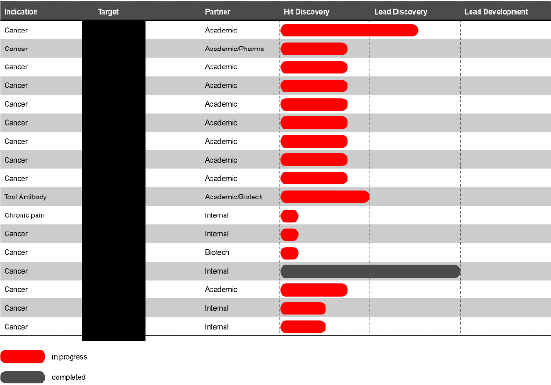 Our internal antibody discovery and development pipeline contains mostly projects from our collaborations. Internal projects are mainly started to develop novel antibody technologies (proof of concept studies). Our novel antibody drug candidates are available for out-licensing or partnering.